Last Week: Waterford defeated Miller 35-25, in Waterford; Wahama lost to Ravenswood 26-14, in Mason. Last meeting between the teams: September 2, 2016. Waterford won 58-0, in Waterford. Waterford offense last week: 199 rushing yards, 80 passing yards. Wahama offense last week: 117 rushing yards, 134 passing yards. Waterford offensive leaders last week: QB Peyten Stephens 3-12-1, 80 yards RB Braden Bellville 22 carries, 200 yards, 3TDs; WR Cody Harris 1 reception, 50 yards. Wahama offensive leaders last week: QB Bryton Grate 8-16-0, 134 yards, 1TD; RB Christian Thomas 14 carries, 36 yards; WR Colton Arrington 4 receptions 87 yards. Waterford defense last week: 160 rushing yards, 53 passing yards. 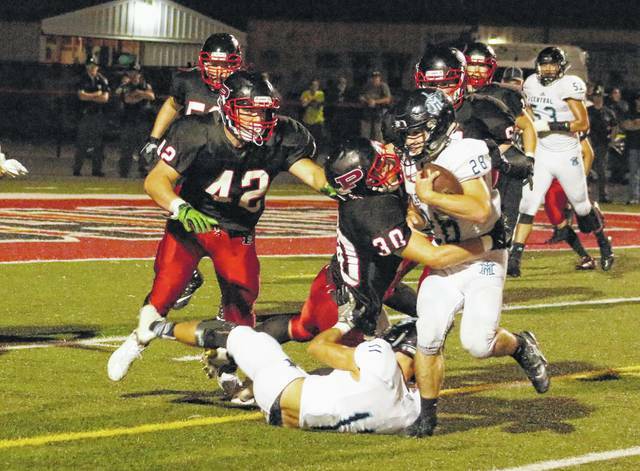 Wahama defense last week: 177 rushing yards, 42 passing yards. 1. Since 1995, the Falcons hold a 9-3 edge in the series. Only one of those 12 meetings, the 2007 contest, has been decided by less than 10 points. 2. Waterford last visit to Bachtel Stadium was on September 4, 2015 and resulted in a 34-0 Wildcats win. Waterford and Trimble are the only two TVC Hocking teams to shut out Wahama twice since the White Falcons joined the league in 2010. 3. Last week, Wahama outgained the Red Devils 251-to-219 in total offense, but lost the turnover battle by a 2-to-1 count. 4. The Wildcats trailed 25-20 with 15 minutes left in last week’s game. Waterford pulled off the comeback with a pair of unanswered touchdowns, giving the Green and White their ninth straight Tri-Valley Conference Hocking Division victory. 5. Waterford lost 11 seniors off of last season’s league championship team, but still has 19 players returning from that squad. Waterford’s 2017 roster features 37 players, including nine seniors. Last Week: Point Pleasant lost to Mingo Central 36-34, in Point Pleasant; James Monroe defeated Greenbrier East 44-34 in Lewisburg. Last meeting between the teams: November 18, 2016, James Monroe won 21-0 in Point Pleasant. Current head-to-head streak: James Monroe has won 3 straight. PPHS offense last week: 168 rushing yards, 308 passing yards. JMHS offense last week: 141 rushing yards, 81 passing yards. PPHS offensive leaders last week: QB Cason Payne 22-29-0, 308 yards, 3TDs; RB Cason Payne 15 carries, 83 yards, 2TDs; WR Josh Wamsley 6 receptions, 103 yards. JMHS offensive leaders last week: QB Monroe Mohler 3-6-0, 81 yards, 1TD; RB Monroe Mohler 14 carries, 70 yards, 2TDs; WR Connor Moore 3 receptions, 51 yards, 1TD. PPHS defense last week: 281 rushing yards, 208 passing yards. JMHS defense last week: 113 rushing yards, 327 passing yards. 1. The Big Blacks have a chance for revenge, facing the team that ended their 2016 postseason run. James Monroe knocked off PPHS in the second round of the Class AA playoffs, winning 21-0 at OVB Track and Field. 2. Point Pleasant’s state-best regular season winning streak has come to an end at 43 games, but the Big Blacks still hold a 20-game winning streak in regular season road games. The last time PPHS lost a regular season road game was October 5, 2012, at Oak Hill. 3. The Big Blacks last visiting Lindside, West Virginia on October 21, 2005. The host Mavericks won that game by a 16-14 count. 4. James Monroe won the turnover battle by a 4-2 count in last week’s win intercepting one pass and recovering a trio of GEHS fumbles. The Generals were ahead 44-14 before surrendering three unanswered touchdowns in the last 6:30 of regulation. 5. In last season’s postseason meeting between PPHS and JMHS, the Mavericks’ became the first team since 2007 to shut out the Big Blacks. In that game, James Monroe claimed a 276-209 advantage in total offense and recorded the game’s only two takeaways. Last Week: Hannan lost to Montcalm 40-0, in Ashton; Green lost to West Union 46-14, in West Union. Current head-to-head streak: Green has won 6 straight. 2. Green’s first game of the year did not count toward its standings in Region 27, as West Union is a club team. 3. Hannan’s last trip to Franklin Furnace was on September 11, 2015 and resulted in a 36-18 GHS victory. 4. Green’s 21-man roster features just one senior. A total of 12 players return to the Bobcats from their 3-7 campaign last fall. 5. Last Friday, all three Mason County teams suffered a loss on the same night for the first time since October 17, 2008. All three Mason County teams hadn’t lost at home on the same night since prior to 1995. Point Pleasant senior Alec Smith (30) sheds a block to hit Mingo Central back Dawson Elia (28) as teammate Tucker Mayes (42) looks on during the second half of a Week 1 football contest at OVB Field in Point Pleasant, W.Va.